I have friends that have flown to Paris to see the Eiffel Tower. Others who have gone to Peru to see Machu Picchu. Our family was blessed that each of our children had foreign learning experiences when they were in college. All of that is wonderful. 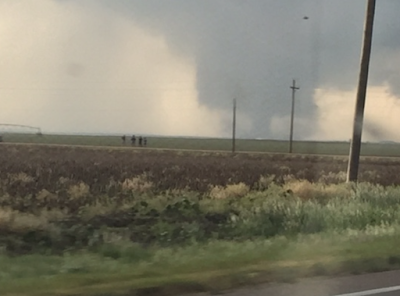 But, few Americans realize that storm tourists come to the Great Plains from all over the world to try to capture the elusive tornado for the same reasons. 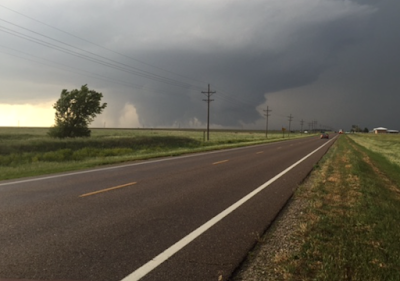 I would like to try to introduce you to why they come and why we storm chasers do what we do. 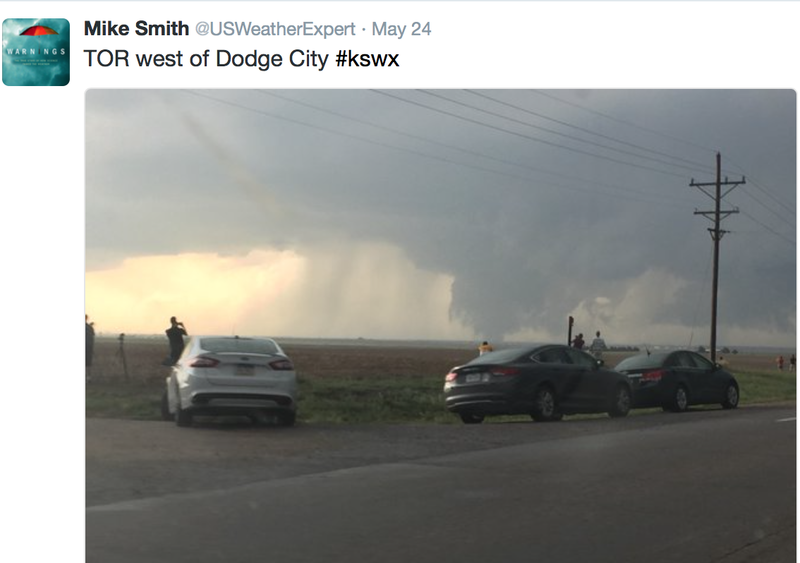 This blog posting is especially timely because of two recent articles about storm chasers, including chasing during the Dodge City tornadoes of May 24. Those articles were written by people who were 1,500 miles away at the time. I was present and will include my first-hand report of what actually occurred. Consider: London’s Big Ben is there any time you wish to see it. The Grand Canyon? Just a trip to northern Arizona. Mount Everest? While it takes tremendous skill and conditioning to climb safely, the mountain is always in place. But the tornado? It takes a considerable amount of skill and luck to get into the right place at the right time to safely see a tornado. There are storm tourists that return to their native countries disappointed: Two weeks sprinting across the Plains in a tourism van without ever seeing a tornado. So, storm tourism is much more of an intellectual challenge that most other forms of tourism. 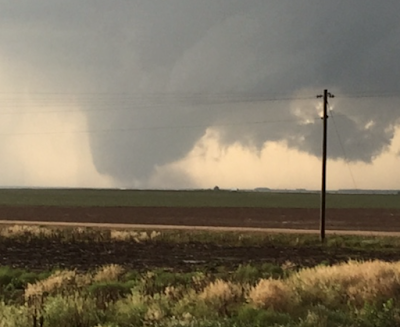 And, if you ask most experienced chasers their favorite state for chasing? Kansas! As many readers know, I was one of the original stormchasers dating back to 1972. The chase program was conceived by Dr. Joe Golden of the National Severe Storms Laboratory (both OU, my college, and NSSL were/are in Norman, Oklahoma). NSSL was developing the first practical Doppler radar. 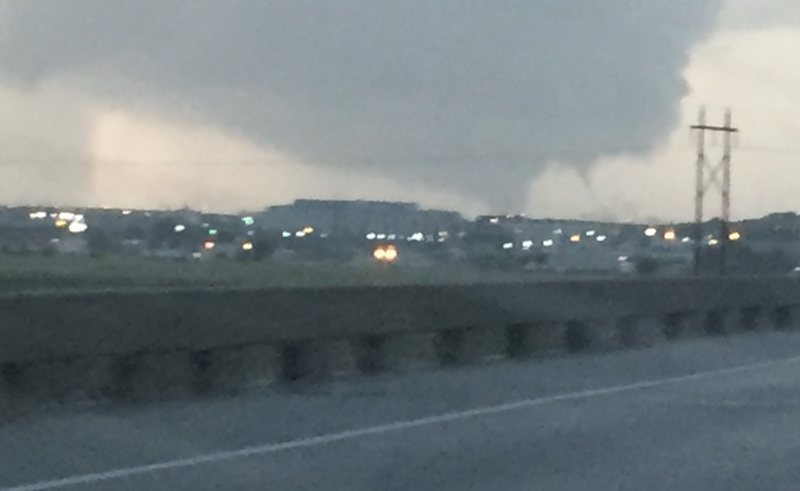 But, there was no way of knowing how good its tornado detection capability was unless there was someone under the storms to report whether a tornado existed or not. Thus, the chase program was born. 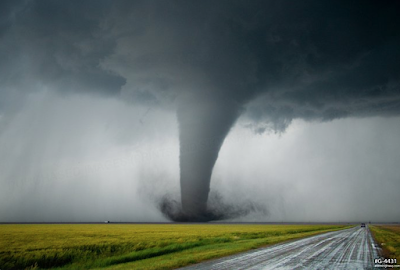 Since 1972, chasers have unquestionably contributed to our scientific knowledge and continue to do so today. We also provide real time information about storms used by AccuWeather, the National Weather Service and others to warn the public of severe storms. 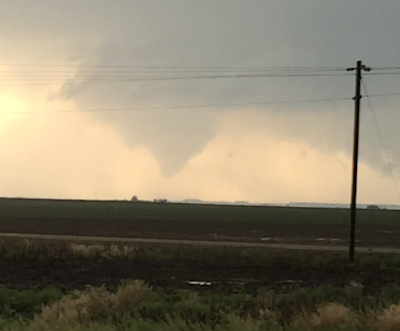 For example, as we approached the storm, I tweeted the fact I could see rotation in the storm. Note the lack of road congestion and that I am tweeting from the passenger seat. As each tornado formed, I tweeted again. In this tweet, I intentionally photographed chasers. Note that all of the cars are pulled well off the highway, safely viewing the tornado on the horizon. Does the NWS use this information? Yes! 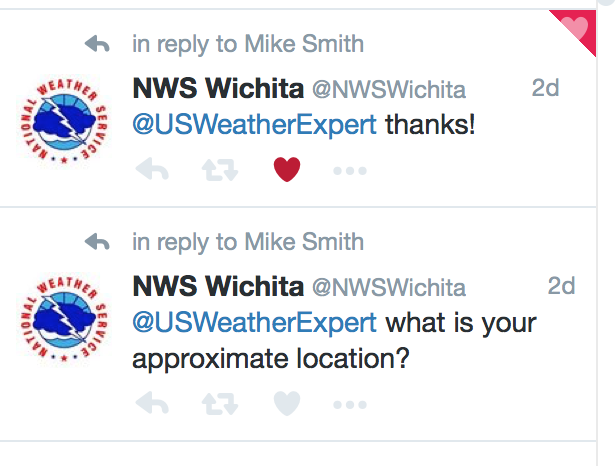 Here is the response from the NWS when I reported large hail two days ago. 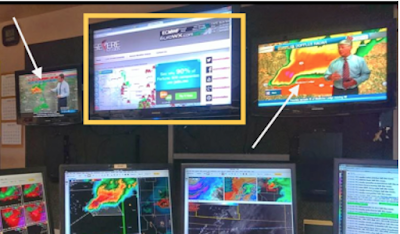 In fact, here is the Dodge City NWS office during an earlier tornado warning using storm chaser information extensively. The arrows point to television stations with chase teams. 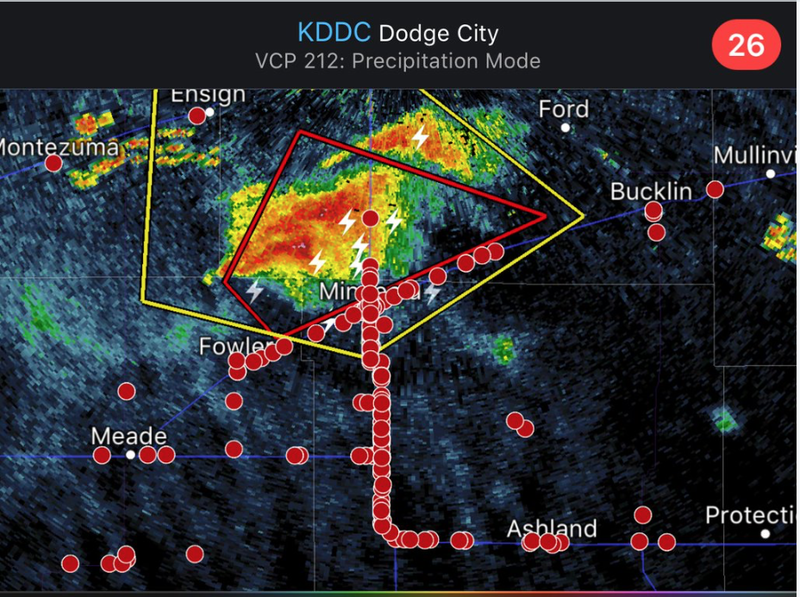 The middle monitor (gold outline) is monitoring a web service that is nothing but storm chasers. 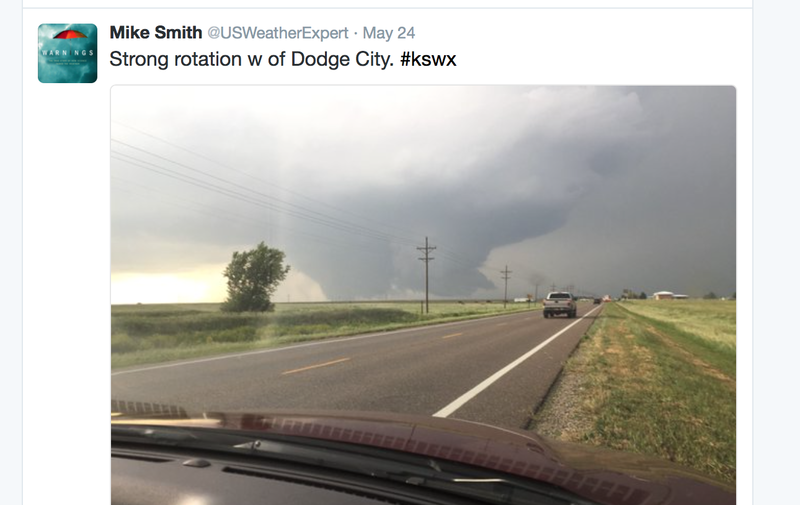 The contentions the NWS does not use this information and that research is not being done by chasers is pure nonsense. While on the subject of the articles, this illustration was used to illustrate how crowded the highway allegedly was. This is the old trick of proportion. Each of the dots is a little smaller than 1 mile in diameter or more than 300 times the size of an actual car. It is the same thing as using the illustration below to contend air travel is unsafe because the skies are too crowded. Of course, the planes are at different altitudes and each dot is probably 1000 times the size of an actual plane. 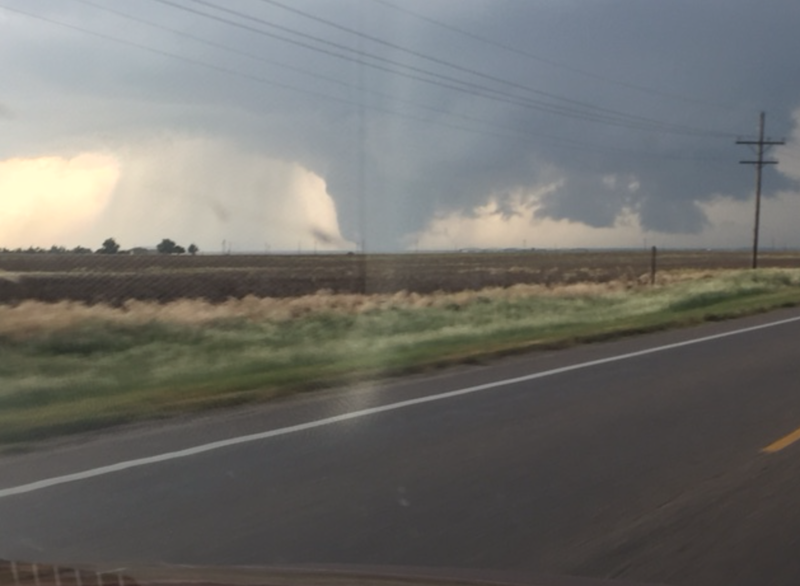 I went through my photos of last Tuesday's chase. This is as bad as the congestion along the side of the road got. 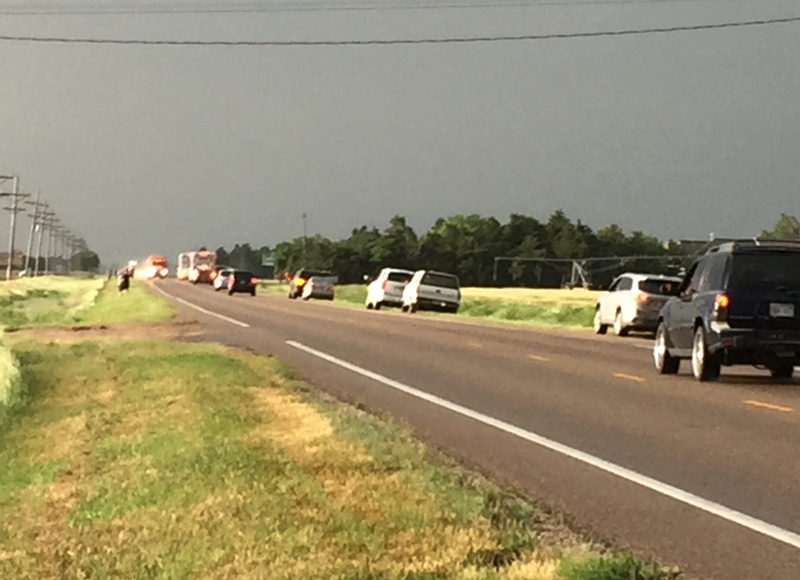 All of the chasers were pulled off the side of the road and were not blocking traffic in any way. Was there more traffic than usual? Of course. But, it was far less than one would experience after a high school football game. And, the roads were far, far less congested than the best day in New York City or Washington, D.C. where the articles were published. As far as the contention that there was congestion near the tornado itself, here is Dan Robinson's photo which should dispel that assertion. 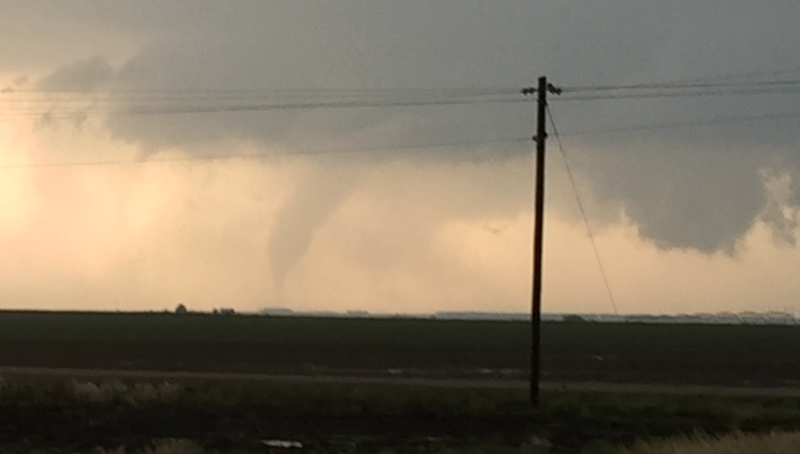 I chase 3-4 times each year, primarily when I believe there is a chance of the type of tornado that can be safely approached. I prefer to chase in threes. One to drive, one to watch the weather and navigate (usually, me) and a third to watch the weather out the far side of the car. So, Kathleen, a good friend and I headed out on Tuesday, May 22. 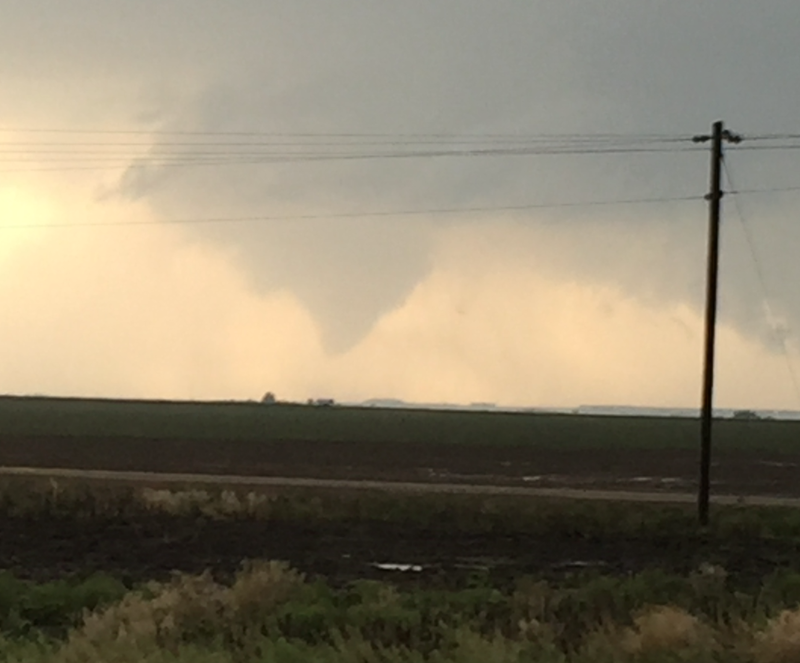 Our target: southwest Kansas. Using the NWS’s Storm Prediction Center’s outlook as a benchmark, their 5% area is the significant risk of a tornado and the Kansas side of the 10% area looked like the best inital target to me. 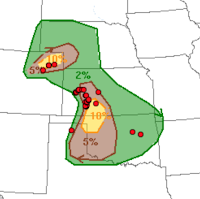 FYI: The red dots are where tornadoes actually occurred that day. As we made our way west, the intersection of U.S. 160 and 283 was the critical decision: Go west to a tornado-warned cell northeast of Liberal that showed signs of regenerating or head straight north to a thunderstorm that had been producing tornadoes for a while – but, statistically, was unlikely to do so much longer. This is where the skill comes in. 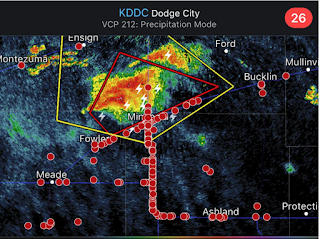 My gut wanted to go west, but my meteorological training said to go north toward Dodge City. I went with my training. We weren’t disappointed. One familiar with the area might ask, why didn’t you take US 54 and get there faster? Reason? We had a person with us who was unfamiliar with chasing and the meteorology of tornadoes. So, for safety reasons, I decided a southern approach was best for this storm. And, suddenly, there it was. 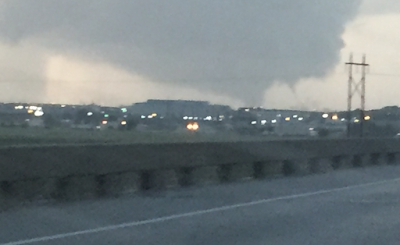 From about seven miles away through clear air, a tornado. Little did we know it would be the first of many. In this case, I wanted to stay well away (we never even heard thunder) for our guest’s comfort and Mother Nature couldn’t have been more cooperative. If you want to read the articles critical of chasing, they are here and here. The thing that bothered me the most was the criticisms of "chasing for profit." Are you kidding? Someone in New York (where you can't step off the sidewalk without risking being hit by a tour bus!) criticizing storm tourism?? 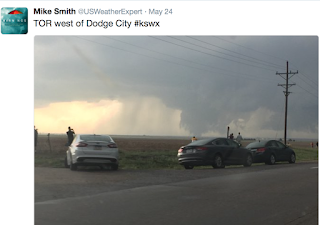 Of course, that article conveniently failed to mention the economic boom to rural America from storm chasing, a topic I wrote about here. The Washington Post article criticized storm chasers who, in their opinion, get too close to a tornado -- while, in the same article, -- printing three of the "too close" photos. These articles come off as more than a little hypocritical and, maybe, a bit envious that they were not in on last week's fun. Please allow me to close by inviting you to come to Kansas (do it safely, allow one of the storm tourism companies to be your sherpa) and see our incredible sky. Note: I had the wrong link to Dan Robinson. It is now fixed.